Tucker: What are we playing tonight, Mike? Me: A game called Cryptid. Me: Fantastic beasts like La Chupacabra, Sasquatch, Nessy; that kinda thing. Timmerman (entering my home): What’re we playing? Timmerman: Oh, sweet! Like Big Foot and Loch Ness? That sounds awesome. This is verbatim the discussion that erupted upon my announcement at my weekly game night that we’d be playing Cryptid from Osprey Games. There was an immediate sense of excitement from Timmerman who knew what the title of the game suggested. Tucker warmed up to the idea…only to cool off to absolute zero when I explained that it was a deduction game. He doesn’t have a great history with those. The mere mention of the game Hanabi gives him panic attacks. But he’s a good sport and joined us anyway. A few minutes later, the game was set up and the instructions were understood by all. We were on the hunt! You and 2-4 of your friends (3-5 players total) will each take on the role of a cryptozoologist on the hunt for an unnamed cryptid in the wilds of North America. Each of you possesses a single clue to its whereabouts. You could collaborate…but where’s the glory in that?! Instead, you’ll have to carefully guard your clue while simultaneously trying to deduce the clues of each of your opponents. There are 108 hexes on the map, but only one hides the cryptid! Cryptid is hands down one of the quickest games to set up and play that I’ve come across to date. To ready the game board, you simply arrange six tiles according to a set up card and add a few wooden bits where indicated. That same set up card also tells you which of the Clue Books each player will use and which numbered clue within they are to utilize during that game. There is also a handy-dandy app you can utilize for the setup and clue dispensing! The gameplay itself consists of either asking one of your opponents if their clue allows for the cryptid to hide in a specific hex on the board, or declaring that you are searching a specific hex for the creature. Either way you gain this game’s most valuable resource: information. When you ask a question of another player, they indicate whether the creature could be hiding in that hex according to their clue by placing either a disc (for yes) or a cube (for no). Tread carefully, though, as for every “no” you receive as a result of your question, you also have to place a cube somewhere on the map – giving everyone else a small hint to your clue. Searching a hex too early will have a similar effect as you’ll have to first indicate that the hex you’re declaring the Search on is confirmed by your clue! As more information literally populates the board via these tokens, you can refer to the list of possible clues at the back of your Clue Book to deduce all of the clues in play, as together they eliminate all hexes on the board save for one! If you Search that one right hex before anyone else, you win! The Glory Will Be All Mine! 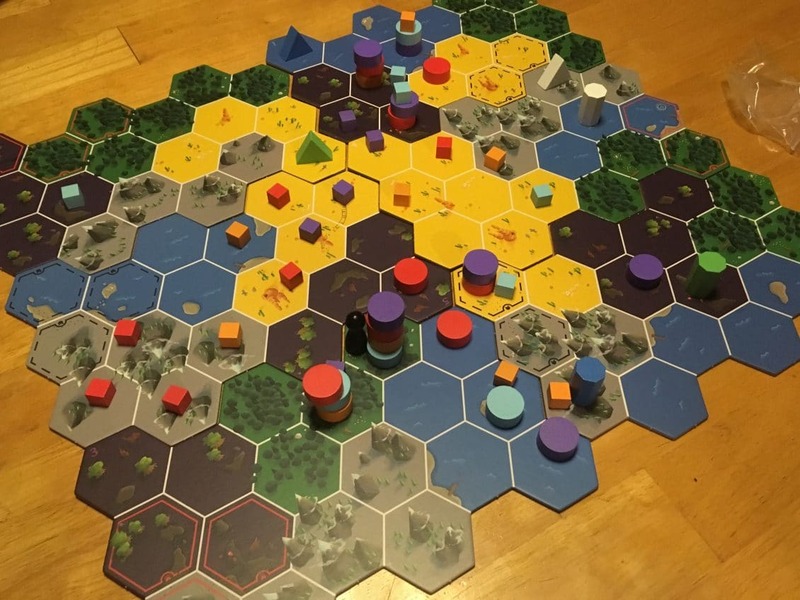 Cryptid allows room for misdirection, but the game is completely dependent on all players placing cubes and discs honestly. If that doesn’t sound like your group, then this might not be the game for you. But that misdirection allowance is everything in this game! Your best chance of Searching the correct hex before anyone else hinges upon you sorting out everyone’s clues while simultaneously doing your best to keep yours obscured! This gives this relatively simple game a surprising and totally lovable strategic depth. Every time I had to place a cube on the board, I felt like I was playing against myself more than anything. Don’t show your hand, Adkins! And whenever I wasn’t being addressed directly about a hex or having to take my turn, I was studying the board to sort out everyone else’s clues. Its like you and your opponents have a professional level of respect for one another as cryptozoologists such that you won’t lie to them…but you’re also totally trying to beat them to the Nobel Prize winning scientific discovery of a lifetime! There was not one second of gameplay during which I wasn’t engaged. That is my absolute favorite aspect of this game. In so many other games, my turn might be somewhat dependent on what the other players might do, but in Cryptid every cube and disc placed on the board is significant! Another pleasant surprise within Cryptid is the fact that there are nearly double the amount of set up cards for the Advanced Mode than there are for the Normal Mode. For our gaming group, Normal was a good warmup or tutorial, but Advanced Mode is where its at! The clues get a bit tricksier! I’m glad that Normal exists for younger players, for sure, but I was genuinely pleased that they didn’t split the cards 50/50. That gives this game a bit more life for us. Our only gripe was the theme itself. We were so psyched about hunting down cryptids of all types that we were pretty bummed it was only skin deep. Cryptids adorn the box and the pages of the rulebook, but that’s about as far as it goes. But to be fair, this does make total sense…I mean, if you knew you were on the hunt for Nessy, for example, you’d eliminate all non-aquatic hexes on the board immediately! I will say this, though: Where the theme is present, it is beautifully illustrated by Kwanchai Moriya. Both the box and the rulebook are beauties! And ultimately I’d play this game regardless of the theme or the target of my hunt. It is that good. It is so good. My gaming group agreed: This is the best new game we’ve played in a long while. Cryptid is a home run. For it to pull off the double stunt of ranking among the fastest setups and shortest learning curves of any games I’ve ever played while also being downright challenging is magical. 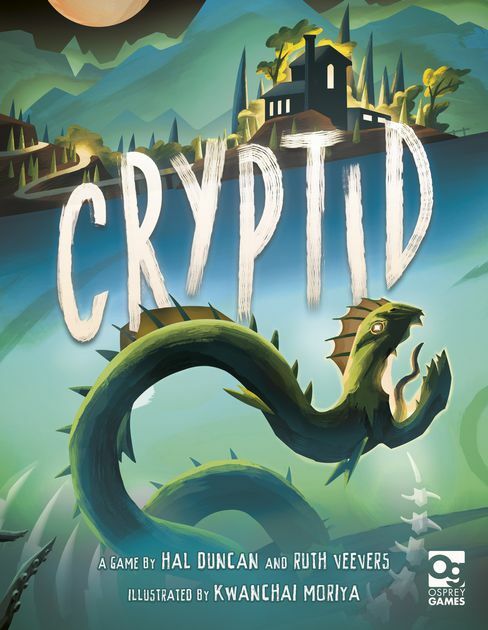 Designers Hal Duncan and Ruth Veevers deliver a cryptid in Cryptid; a rare gem of a game that, once discovered, shouldn’t be kept secret. You can snag yourself a copy of this fantastic game from Amazon for less than $30!